Hi there, I will start the breakdown of a Grand Tableau to apply the theory that has been covered until now. I will do this in several posts, step by step. Click on the picture that represents the Grand Tableau to view it full size if you need. I only put the cards that will be read in this post. I think it keeps things visually simple. This is actually a spread I did for myself, so feedback will be easy. 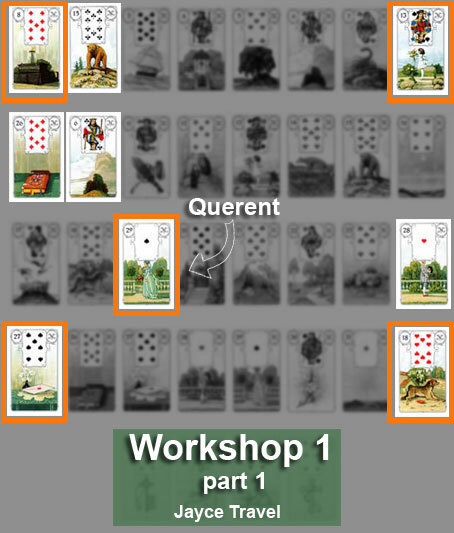 If you need to read some theory first, click on the link “The Grand Tableau” within the Lenormand cards category on the right of this page. The location of the Querent’s card is the first thing that will be analysed and then, the 4 corners.